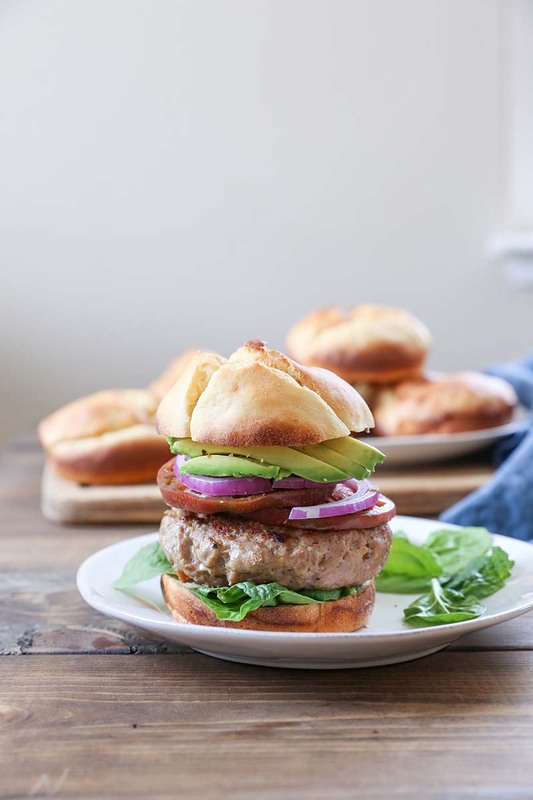 Your burgers deserve a delicious homemade bun! Select the DOUGH cycle, but stop the machine as soon as the mixing is done; do not allow dough to rise in the machine. Grease hamburger bun cups or English muffin rings and place on greased baking sheet or baking sheet lined with parchment paper. Spoon batter into rings; smooth tops (wet finger tips and smooth dough). Cover; let dough rise approximately 30 minutes. Preheat oven to 375ºF. Bake for 15 minutes, or until tops are golden brown. Cool on rack. Remove from rings after 10 minutes. Heat water to 110-115ºF and pour into mixer bowl. Add yeast and allow to hydrate for 5 minutes. Add eggs, oil and honey to yeast mixture. Stir to combine. Thoroughly blend dry ingredients (except yeast, which is already added to water). Do this either in a separate bowl with a wire whisk or shake together in a gallon size, self-sealing plastic bag. With the mixer on low speed, fitted with a paddle, gradually add dry ingredient mixture to liquid ingredients until all dry ingredients are well blended. Beat on medium speed about 5 minutes. Grease hamburger bun cups or English muffin rings and place on greased baking sheet or baking sheet lined with parchment paper. Spoon batter into rings; smooth tops (wet finger tips and smooth dough). If desired, score tops of dough with an X using a sharp knife. Cover; allow to rise approximately 30 minutes. Preheat oven to 375ºF. Bake for 15 minutes, or until tops are golden brown. Cool on rack. Remove from rings after 10 minutes. Recipe featured at The Roasted Root. You can substitute Instant (Quick Rise) Yeast in place of Active Dry Yeast in gluten free recipes. When using Instant Yeast, expect your batter/dough to rise faster - about 50% faster. Adjust your rise times accordingly. Traditional methods: substitute equal amounts; Bread Machine: use ½ tsp Instant Yeast OR ¾ tsp Active Dry Yeast per cup of flour in your recipe. Visit Gluten Free tips and Lessons in Yeast & Baking for more information.